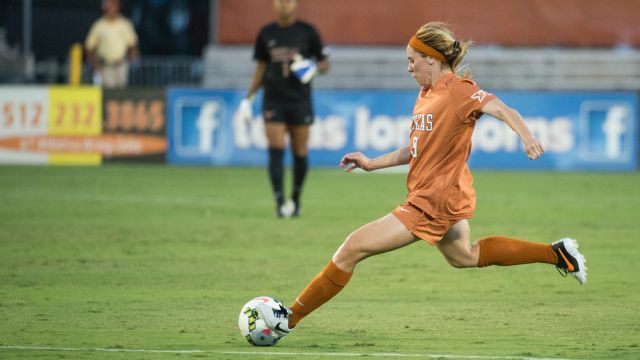 The Texas women’s soccer team fell to the University of North Carolina Tar Heels, 2-0, in the home opener Aug. 28 at Mike A. Myers Soccer and Field Stadium. The loss leveled UT’s season record at 1-1-0. The Tar Heels held a 4-0 record against the Longhorns in the previous meetings between the schools. Texas came into the game with a 1-0 record after a season-opening victory over Miami, while UNC started the season with a 2-0 record. The fact that UT’s home opener was against one of the nation’s marquee programs created huge excitement around the game, which drew more than 2,100 fans. During the first half, UNC put the pressure on Texas, outshooting the Longhorns, 8-3. The Tar Heels continued to build a strong defense against the Longhorns with a strong back line. Texas head coach Angel Kelly said she knew adjustments would need to be made to score. “Credit to North Carolina, I thought we were well organized the first half but, you can’t afford to make any mistakes,” Kelly said. At the top of the second period, UNC picked up the tempo quick with scoring the only two goals within the 46th and 48th minute. In the 46th minute UNC midfielder Cameron Castleberry swiftly moved passed senior Longhorn goalkeeper Abby Smith to score an unassisted goal. Shortly into the 48th minute fellow UNC Tar Heel Joanna Boyles shot off a rebound off a shot by teammate Summer Green to score the second goal from the top of the 18-yard box. Kelly reflected on both goals scored and how defense is the key to building the team. Texas was outshot by Carolina, 23-7, but Smith, who finished with seven saves, remains optimistic about the season ahead. Texas will host Ohio State at 1 p.m. Sunday in a game that will be televised on The Longhorn Network at 1 p.m.